Many of you are probably already fans of Happy Home Fairy, one of my favorite blogs for fun kid crafts and games, free printables, and general mom encouragement and hilarity. Julie, aka the Fairy herself, is a friend from high school and I love that I get to keep up with her sweet family through her blog! 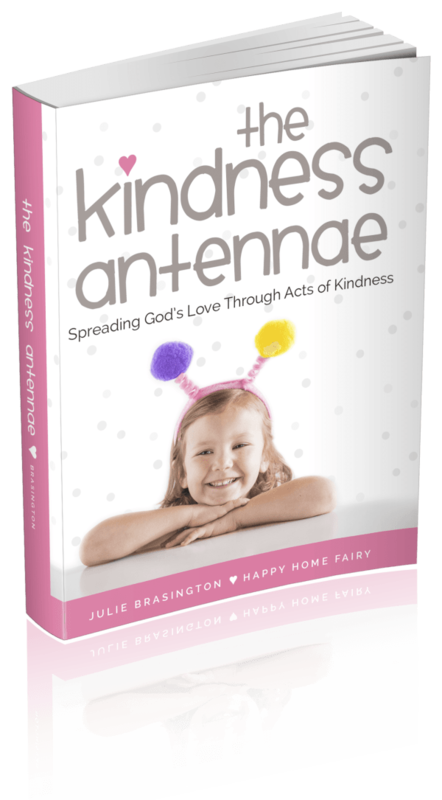 Julie recently published an ebook called The Kindness Antennae. She kindly (see what I did there?) sent me a copy and my oldest daughter and I had a lot of fun deciding on an act of kindness to bless some of our friends! You can read about our sneaky kindness adventure here – I would love for you to check it out! But even more than that, I would love for you to read Julie’s book. It’s funny and poignant and encouraging, and there are hundreds of really doable ideas for how to be kind to those around us, and how to include our kids and teach them to be kind, too. I read it on my phone in a waiting room and had to cover both snorts of laughter and tears rolling down my face. It’s a must-read. You can buy a digital copy here – and one of you dear people can win one! All you need to do is leave a comment below and tell me a way that kindness has influenced your life. If you want a bonus entry, you can become an email subscriber! That means you’ll get an email when there’s a new Bet On Dinner post (lately, about once a week). Just type in your email address on the right (on desktop) or at the bottom under my picture (on mobile). If you are already a subscriber, just let me know that in your comment and you’ll automatically get a second entry. :o) The giveaway ends on Monday, March 7, at 12 pm and the winner will be announced on Tuesday! I love both of your blogs! I found you through the Happy Home Fairy blog. I’m a subscriber of both actually. Kindness has influenced my life in so many ways. Growing up I learned from example by my parents and grandparents. Now I’m instilling this in my sweet baby. I had some pre term labor scares with Charlie and I had one friend in particular that would call and ask which night (giving 2 choices) would be better for her to bring dinner. Not a vague let me know if you need anything but a specific, direct, easy to accept and oh so helpful offer. It taught me a lot. That is so true! It makes it much easier to accept an offer like that. Thanks Linda! Hmm, people have encouraged us in so many ways. Meals have always been such a gift, and friends offering to babysit for free have been awesome. But one of the most memorable things to this day was having sweet Kara meet me in the doctors office parking lot unexpectedly when she knew I could have a potentially tough doctors appointment with E as a baby. Walking out to the parking lot to find a friend there to give me a hug was such a gift. Aww, I love that! What a good friend. Miss you both!!! Also, I’m already a subscriber. ???? What a great neighbor! Thanks for subscribing, Shelley! When I had my second baby, so many people brought us meals. Even some people who didn’t know us that well. It was such a blessing. Now I want to do the same act of kindness when others have babies! My hubby is deployed so I needed a sitter every Thursday so I could go to work. The mom of the girl I hired asked if she could pay her instead of me. Be still my heart. Kindness matters. Little is so big! I want to hug her! Thanks for sharing, Cristi! I was touched by a neighbor who shoveled my walk and long driveway before 7am on a day that I had to get to the doctor with no time to spare! Happy Home Fairy is so encouraging to me. Julie is an inspiration! She brings kindness as well as tells how she navigates the difficult times. Now I signed up for Bet on Dinner. Bring on the Kindness. I hope to pass it on. I agree, I love Julie’s transparency!! Also love how your neighbor cared for you. Thanks for sharing and for subscribing!